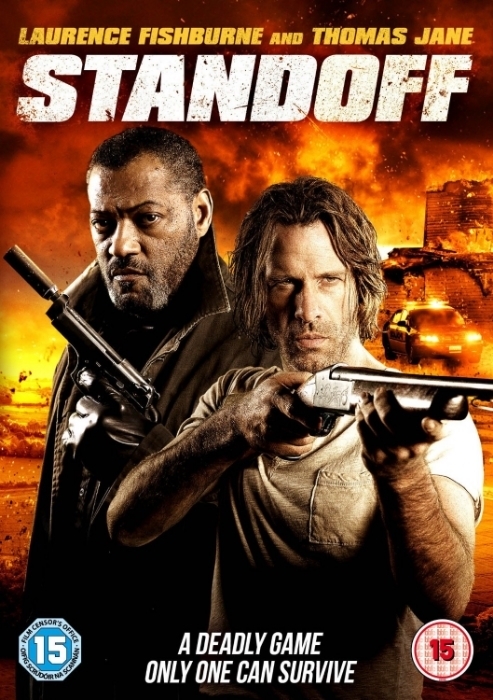 Stand Off is a solid thriller with great performances from its leads, including young Ella Ballentine. This is a film which doesn’t waste time getting the audience sucked into the story. After a brief set-up – Carter and family before the accident, Bird arriving at the cemetary with her “uncle”, we get straight into the action. Sade is at the cemetary to tie off loose ends – a nameless grieving widow is his target, and he’s ruthless in his carrying out his orders. He wears a black hood to protect his identity, but takes it off momentarily and is photographed by Bird. Now that she’s seen his face, Sade is dead set on finishing her off. After a moment of drunken neglect leads to a tragic accident, the loss and weight of guilt lies heavy on the shoulders of veteran Carter, who we meet writing his suicide note. Before he can act on it though, the shrill voice of young Bird screaming for help comes through the window. Before he even knows what’s going on, he finds himself shot in the leg by the pursuing Sade, but Carter is able to provide Sade with a nasty surprise of his own. The bulk of the film is set withinside Carter’s house. Sade prowls the ground floor, looking for weaknesses, taunting Carter and trying to bargain for the life of Bird. Meanwhile Bird and Carter develop a tenuous bond between them, and we slowly learn the full extent of the tragedy which befell his family. The film is carried, therefore, for the most part by the two antagonists, Carter and Sade. It’s fair to say that both actors have passed the point where their names would get box-office attention but both still put in big performances. First time director Adam Alleca is better known as a screenwriter, providing the screenplay for this film, and gives his leads some strong dialogue to work with. If the film does have a fault it’s the introduction of a character outside the Carter residence. Although given a strong introduction, it soon becomes apparent that this person is merely cannon-fodder, to provide Sade with a new victim to fill in the running time. Finally, Ella Ballentine deserves a mention: as the put-upon Bird, she quickly wins the audiences’ sympathy. She’s had to deal with the loss of her parents and now has to put up with her aunt’s latest sleazy boyfriend. She hides behind the camera left to her by her father and has kind of grown to expect the worst of everybody. When Sade begins his seige of the house and makes his demands, Bird all but accepts the notion that Carter will giver her up in a second to save himself, and actually starts to go down the stairs to meet her fate, which is pretty heart-breaking. Their bond isn’t born out of need but recognizing the hurt each is carrying. Not the biggest or boldest action film you’re likely to see in 2016 but this is a very good way to start the year. Fishburne and Jane are always watchable and its great to see them being given a couple of meaty roles with great dialogue.